Firefighters early Thursday battled a two-alarm blaze that damaged an abandoned building in East San Jose, fire officials said. Kris Sanchez reports. Firefighters early Thursday battled a two-alarm blaze that damaged an abandoned building in East San Jose, fire officials said. Fire crews were dispatched to a commercial building at 1064 S. White Road around 3 a.m., according to San Jose fire Capt. Mike Van Elgort. The blaze burned for about two hours after a security guard reported it. Van Elgort said the fire appears to have sparked in a dumpster outside the building, but doesn't look like arson. The damaged and now partially collapsed building is the former location of an O'Reilly Auto Parts store. However, it is now empty so fire officials are not concerned about chemicals, oil or any other flammable material that might have been inside otherwise. According to Van Elgort, the fire was fully involved with heavy flames when crews got to the scene. Firefighters are expected to stay at the building until later in the morning, monitoring hot spots. The fire at the popular strip mall had been extinguished around 5:15 a.m., Van Elgort said. There were no reports of injuries and the cause is under investigation. VTA bus lines 25 and 71 were rerouted temporarily. Service has since returned to normal. This is the site of a four-alarm fire that broke out last June. At that time, a vegetation fire behind the O'Reilly store spread to the building. 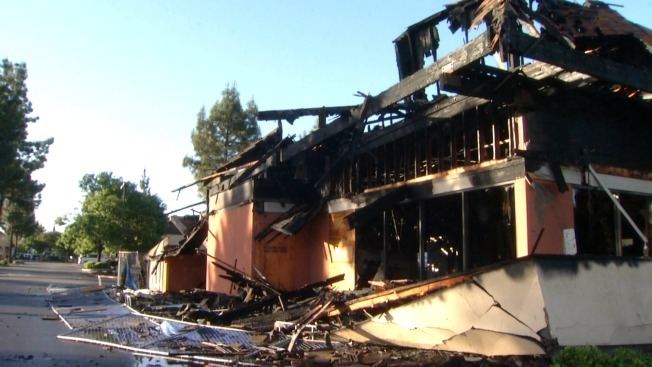 Bystanders told NBC Bay Area that homeless people used to take shelter in the now scorched space, but it’s not clear whether squatters living there was a factor in Thursday’s or last year's fire.